/disney-beauty-beast-remake-cast-photo-selfie/Yesterday, we got our first look at the cast of Disney's live-action Beauty and the Beast remake. Josh Gad, who plays Le Fou, shared a selfie that included himself alongside co-stars Emma Watson (Belle), Luke Evans (Gaston), Dan Stevens (Beast) and Kevin Kline (Maurice). 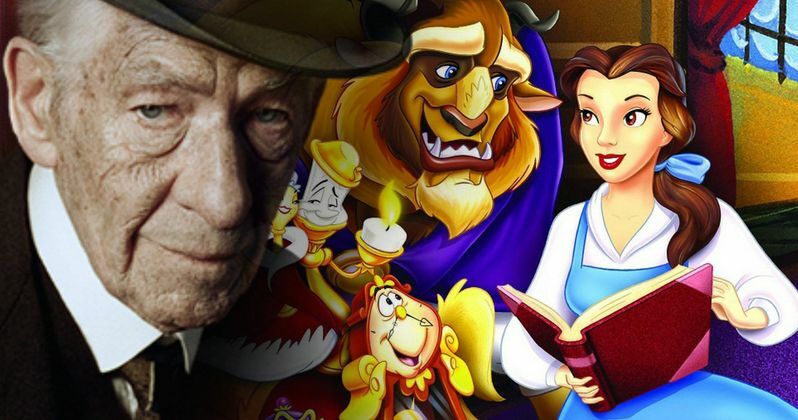 Missing from the photo was Ian McKellen, who stars as the Beast's butler turned alarm clock Cogsworth. To make up for that, he has reported back from the set with an in-depth account of the first table read. Beauty and the Beast will begin shooting in London very soon under the direction of Bill Condon, best known for musicals Chicago and Dreamgirls. Also participating in the cast read were Emma Thompson (Mrs. Potts) and Gugu Mbatha-Raw (Plumette), though they were not pictured. The only primary character from the animated version that hasn't been cast yet is Lumiere, voiced by Jerry Orbach in the 1991 movie.